This mural evokes the history of a neighbourhood through culture, literature, and knowledge. The work brings together fact and fiction embroidered with the colours of the local former Lomas, Paton, and Kayser factories. 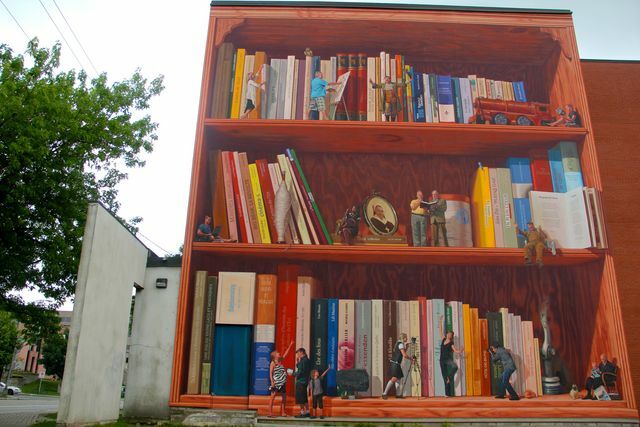 This mural replaces the stories of the Collège du Sacré-Coeur high school with the levels of a bookcase housing tiny characters, in front of books from the literature of the Eastern Townships region. 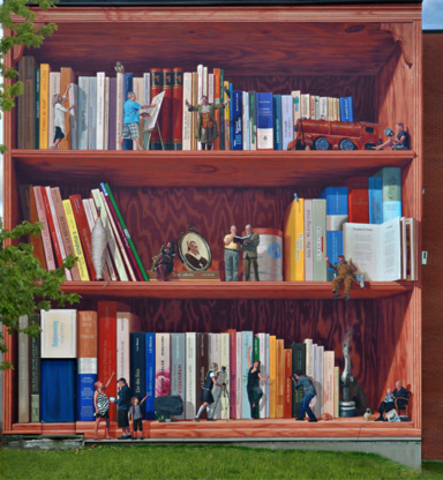 This mural is an allegory of Sherbrooke standing as a centre of knowledge, as well as a metaphor of the literary universe with more than 100 local authors represented. We can also see several historians of the region, and some of them are still alive. 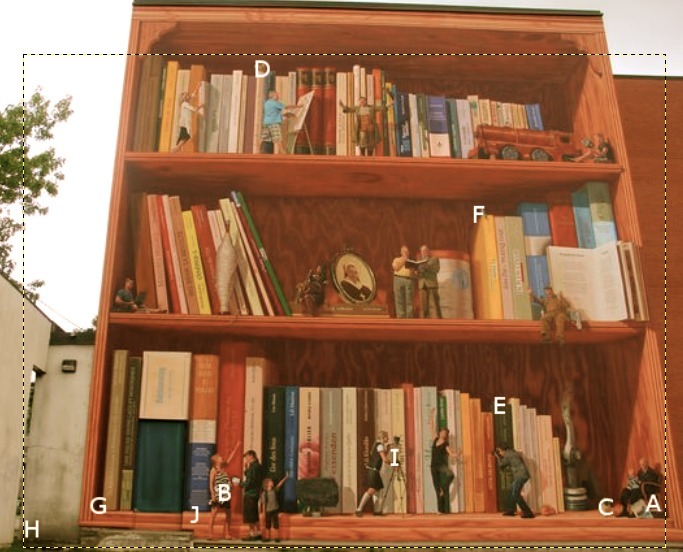 This trompe-l’œil mural evokes the history of a neighbourhood through literature, culture and knowledge where small characters walk on the levels of a bookcase like it was a building. With a saxophone, Gloria Mampuya was a member of the Collège du Sacré-Coeur wind ensemble. 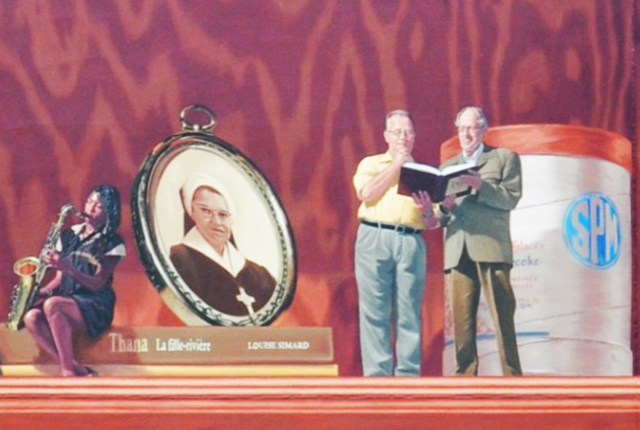 On the right is Antoine Sirois, a priest-educator and an Emeritus Professor at the Université de Sherbrooke. 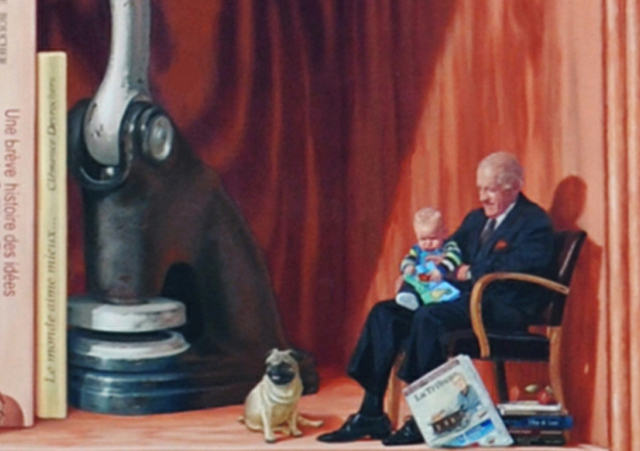 Sitting on an armchair, Marcel Bergeron was a securities advisor for many years besides practicing several sports. At his feet, we can see La Tribune, the only French daily newspaper in the Eastern Townships. Heart, Culture & Pedagogy - Find and Seek!